A Disaster Recovery Center (DRC) is a readily accessible facility or mobile office where survivors may go for information about our programs or other disaster assistance programs, and to ask questions related to your case. Representatives from the Federal Emergency Management Agency, U.S. Small Business Administration (SBA), state, volunteer groups and other agencies are at the centers to answer questions about disaster assistance and low-interest disaster loans for homeowners, renters and businesses. They can also help survivors apply for federal disaster assistance. A Disaster Recovery Center (DRC) is open in Kea‘au, Hawai’i, jointly operated by the state of Hawai‘i and FEMA. The DRC is located at Pahoa Neighborhood Facility, 15-3022 Kauhale Street, Pāhoa, HI 96778 and will be open weekdays from 8:00 am to 5:00 pm, and CLOSED Saturdays and Sundays. This facility closes Friday, September 28 at 5:00pm. People can register for assistance at the DRC, as well as having many of their questions answered. FEMA, the U.S. Small Business Administration, and state and county government agencies will be present at the center. Meet one-on-one with FEMA staff at the recovery center. If you are a survivor who has left the area, call us at 800-621-3362 (711 or Video Relay Service) and TTY 800-621-3362. 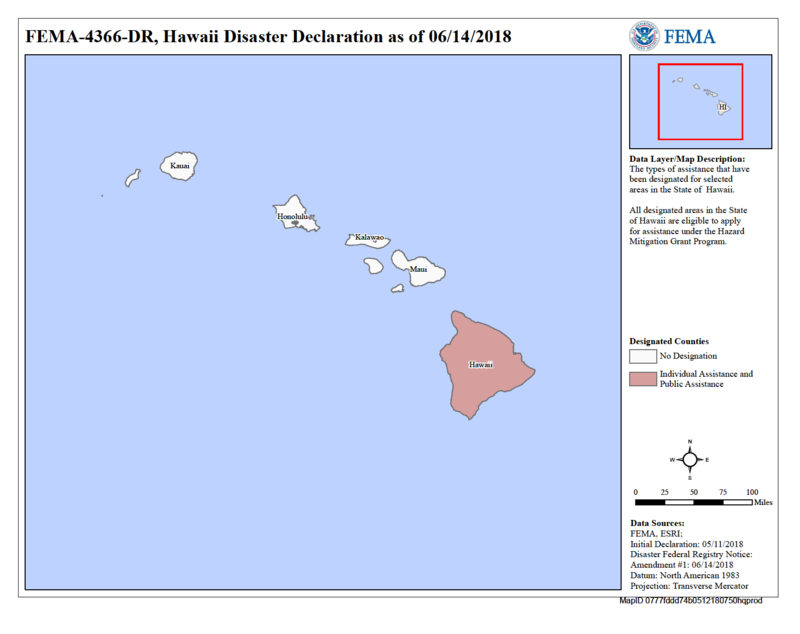 Homeowners, renters, private nonprofits, and business owners in Hawai’i County who sustained damage to their homes, vehicles, personal property, business or its inventory as a result of the Kilauea volcanic eruptions and earthquakes may apply for federal assistance. The deadline to appy for FEMA assistance is September 12, 2018. The toll-free numbers are open from 8 a.m. to 6 p.m., seven days a week. There is no obligation to accept a loan, if one is offered. If SBA finds that you do not qualify for a disaster loan, you may be referred back to FEMA for possible other assistance. Q: I'm self-employed and out of work. Do I qualify for disaster unemployment assistance? Q: What is an SBA disaster loan? The U.S. Small Business Administration is the federal government’s primary source of money for the long-term rebuilding of disaster-damaged private property. SBA helps businesses of all sizes, private nonprofit organizations, homeowners and renters fund repairs or rebuilding efforts and cover the cost of replacing lost or disaster-damaged personal property. These disaster loans cover losses not fully compensated by insurance or other recoveries and do not duplicate benefits of other agencies or organizations. SBA is working in conjunction with Hawai’i County Civil Defense Agency and FEMA to help business owners and residents recover from the Kilauea eruptions and earthquakes. Q: Who is eligible for SBA low-interest loans? The SBA is authorized to offer low-interest disaster loans to businesses of all sizes (including landlords) private nonprofit organizations, homeowners and renters that have sustained disaster-related damage. Q: What’s the most common misunderstanding about SBA loans? The most common misunderstanding about an SBA loan is the assumption that SBA disaster loans are only for businesses. While SBA offers loans to businesses of all sizes, low-interest disaster loans are also available to private nonprofits, homeowners and renters alike. Q: When should you apply? Businesses, private nonprofits, homeowners and renters should apply right away with SBA as part of the overall federal disaster recovery process and not wait for any insurance claims to settle. Q: Why should you apply? Survivors are encouraged to submit disaster loan applications even if they do not believe that they will need a disaster loan. There is no obligation to accept if offered. Q: What is available as part of the SBA low-interest loan programs? Q: How do I register for FEMA assistance? At the Disaster Recovery Center in the Pahoa Neighborhood Facility, 15-3022 Kauhale Street. This facility closes Friday, September 28 at 5:00pm. Most survivors who register with FEMA are automatically referred to the SBA. Survivors are encouraged to speak with SBA representatives to learn about the resources available. Q: What are the loan terms? Interest rates for SBA disaster loans are as low as 1.938 percent for homeowners and renters, as low as 3.610 percent for businesses and 2.5 percent for private nonprofit organizations, with terms up to 30 years. Q: How do I apply with the SBA? To apply for SBA low-interest disaster loans, Applicants can visit the disaster recovery center for one-on-one assistance or apply online using SBA’s secure website at https://disasterloan.sba.gov/ela. In addition, applicants can get more information on SBA disaster assistance by calling SBA’s Customer Service Center at (800) 659-2955, by visiting www.sba.gov/disaster, or by emailing disastercustomerservice@sba.gov. Individuals who are deaf or hard of hearing may call (800) 877-8339. Paper applications may be requested, and completed paper applications should be mailed to U.S. Small Business Administration, Processing and Disbursement Center, 14925 Kingsport Road, Fort Worth, TX 76155. Residents of Hawai’i County who have felt the ground rumble beneath their homes as a result of the ongoing Kilauea eruptions and earthquakes are encouraged to look carefully for damage. unexplained debris near wall and floor joints. by phone at 800-621-3362 or (TTY) 800-462-7585. Applicants who use 711 or Video Relay service may call 800-621-3362. The toll-free numbers are open 8 a.m. to 6 p.m. seven days a week. Until further notice, the DRC is open weekdays from 8 a.m. to 5 p.m. and closed on weekends. Residents are encouraged to monitor sulfur dioxide and hydrogen sulfide on Hawaii Island by visiting the Civil Defense website, or go directly to www.epa.gov/kilaueaairdata. The State Department of Labor and Industrial Relations (DLIR) has announced that Disaster Unemployment Assistance (DUA) Benefits Are Available. http://labor.hawaii.gov/blog/news/disaster-unemployment-assistance-dua-benefits-are-available/ For more information, visit the Disaster Recovery Center currently located at the Pahoa Neighborhood Facility, 15-3022 Kauhale Street, from 8:00 a.m. to 5:00 p.m. Monday - Friday, closed Saturdays and Sundays, or contact the Hilo Claims Office at 974-4086 for more information. For more detailed information regarding eligibility for DUA benefits, go to the DLIR website at http://labor.hawaii.gov/ui/assistance-programs/ or contact the Hilo Claims Office, Kinoole Plaza, 1990 Kinoole Street, Suite 101, Hilo, HI 96720-5293, ph: 974-4086.